UPDATE (6:40PM, 30 Nov): The government has announced the process for finalising its transport plan on Transport for NSW’s website. It will involve a 12 month period of consultation with the community and various interest groups before a final version of the plan is finalised. A discussion paper and draft plan will be released during 2012, prior to the completion of the process. 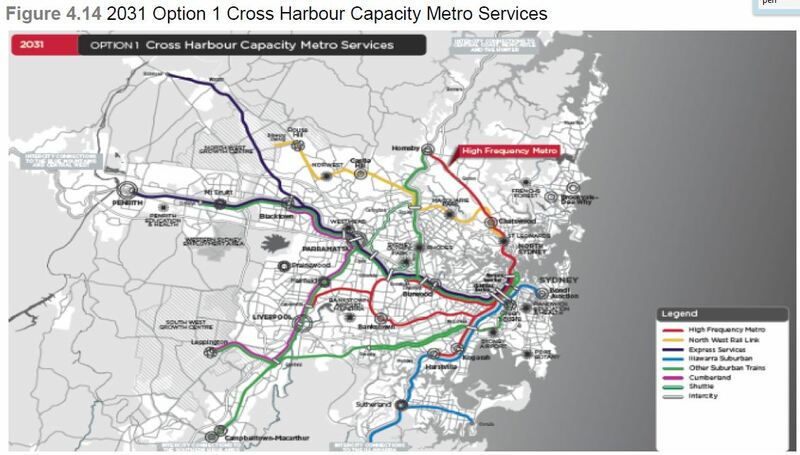 This is a welcome move, and should help to prevent the transport planning disasters that we’ve had in Sydney in the last decade (such as the $500m cost of the aborted Rozelle Metro). 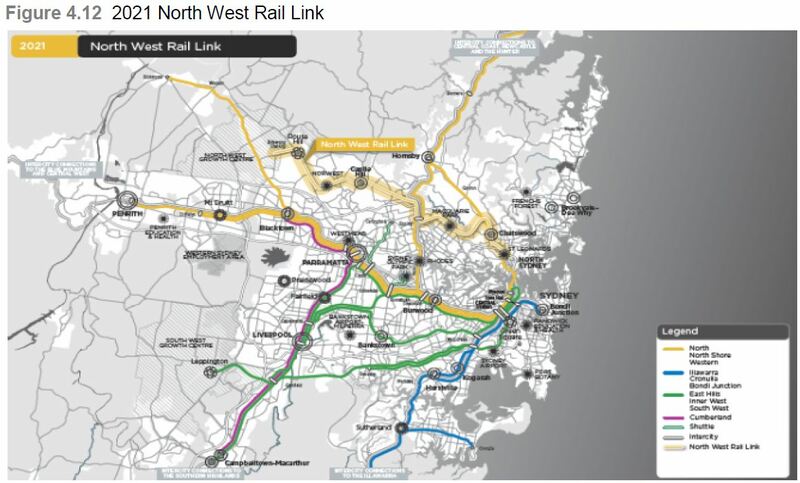 The NSW Government has released a draft version of the rail portion of its transport plan. It’s definitely worth a read – the first half outlines existing projects (NWRL, SWRL, etc), so if feel free to skip to page 24 if you want to get to the meat of the report. I have previously voiced concerns about a new transport plan, as it suggests trashing the previous plan and starting again from scratch. In NSW, this reminds me all too much of the Rees Labor Government’s Rozelle Metro, which cost NSW tax payers $500m before being scrapped – $500m that couldn’t be spent elsewhere. 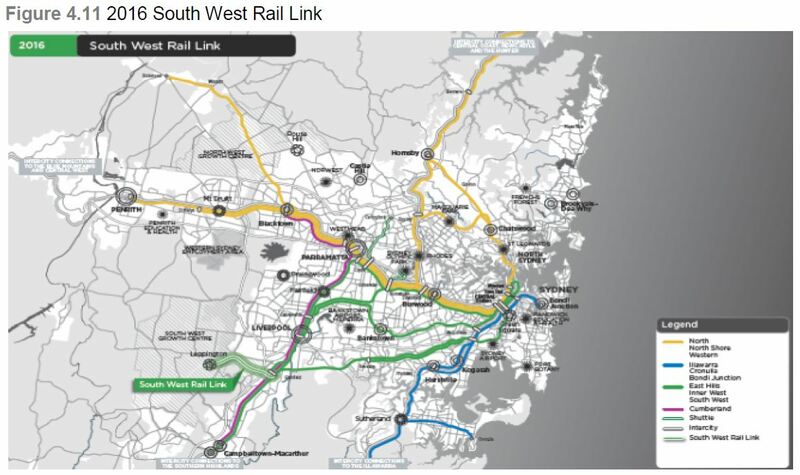 However, the new plan appears to retain all the key elements of the previous plan developed under Kristina Keneally’s government in 2010: a Southwest Rail Link, a Northwest Rail Link and a Western Express (including a City Relief Line), and then provides a number of options through to 2036 for expanding network capacity after these projects are complete. One thing not included in the report is the cost of each option. 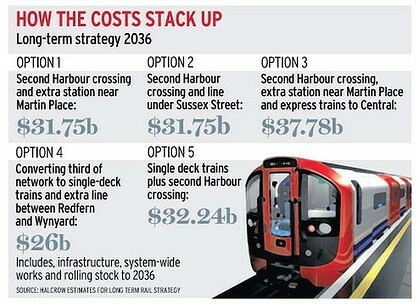 The Herald has obtained estimates of the costs, which range from $26 billion to $38 billion (see below). However, the Herald also points out that the costs may not have been calculated consistently, and that the Sector Five option (which involved maintaining a fully double deck network) includes the costs of necessary upgrades but the other options do not, despite also requiring the same upgrades. If true, this would suggest the report is biased towards the metro proposal. It has been suggested (I can’t remember where) that the Western Express trains will stop at Blacktown, Seven Hills, Westmead and Parramatta before continuing express to Central and the CBD stations. Central may be misleading, as the platform may actually be located underneath Railway Square, a few hundred metres West of the suburban rail platforms, then continuing North most probably either under Sussex Street towards Barangaroo or under Pitt Street towards Martin Place. It is after this point that the plans diverge. 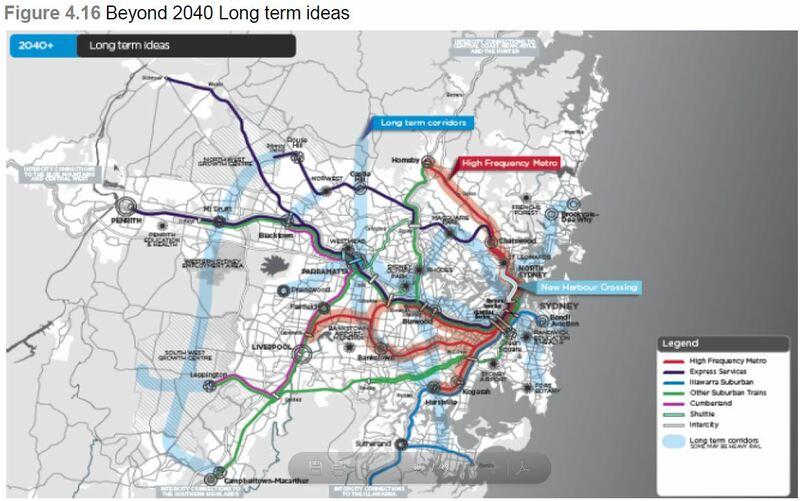 One plan recommends converting a large portion of the network to single deck metro, the other recommends connecting the City Relief Line to Chatswood. 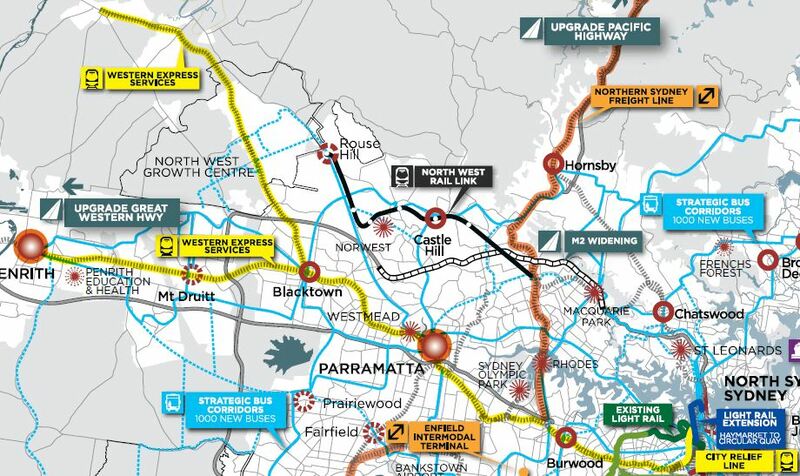 These plans seem to suggest the Parramatta to Epping Rail Link and Chatswood to St Leonards Quadruplication might also be built, but no mention is made of either in the document. What is common for both plans is a merging of the non-express Western trains (which start at St Marys) with South Line trains going from Liverpool to the City via Granville. This makes a lot of sense as it puts each different line onto a different physical set of tracks: the Western Express trains on the Main West Line, the St Marys and Liverpool/Granville trains on the Suburban West Line and the Homebush starting Inner West trains on the Local West Line. Currently Western Line and South Line trains share track between Granville and Homebush, while South Line and Inner West Line trains share track between Homebush and Redfern, despite each having separate stopping patterns (i.e. express, limited stops and all stations). This makes it a 25 year plan, however there are also a number of future corridors which it recommends should be kept for future consideration, allowing land to be reserved for any developments in the future. 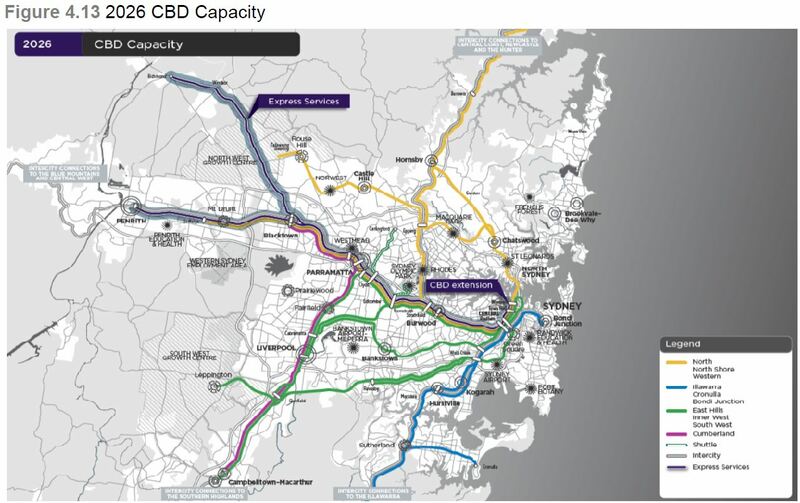 The report points out that these corridors may end up being developed either as a non-rail option (such as light rail along the Anzac Parade corridor) or as part of a “stand-alone rail system” (code for metro) in addition to just adding to the Cityrail network. Realistically, other than a minority of these corridors (the NWRL and SWRL extensions in particular), I would imagine that no further extensions would be made to the Cityrail network, with any new developments either forming the start of a new metro network or an extension of the metro network created by converting a portion of the Cityrail network. The Cronulla Line, while electrified since it opened in 1939, remained almost entirely single track. Instead there were crossing loops at Gymea and Caringbah stations, each roughly at one third intervals between Cronulla and Sutherland stations, which allowed trains going in opposite directions to pass each other while at those two stations. The line between these two stations would eventually be duplicated in 1985, allowing trains to pass each other at any point in this middle third of the line. Next week: the East Hills Line is extended to Glenfield on the South Line. I’m a supporter of higher density, as my post last week on the Randwick Council housing plan decision probably suggested. I think it helps in building walkable communities, improved public transport and more sustainable living. But whatever your views on the pros and cons of density, there is undeniably a link between urban planning and transport. Where we live determines where we go and, more importantly, how we get there. There’s a couple of articles/talks/documentaries which I think cover these topics really well, and I’d highly recommend them to anyone interested in contemporary housing/transport in Sydney. Housing for Millions – This is a Background Briefing piece on how Australian cities will manage the challenge of finding sufficient housing for the estimated 10 million additional residents that are expected be living in Australia over the coming decades (not to mention those who are already here). It outlines the problem of housing affordability, the impact of NIMBYism, what constitutes good urban planning and what governments are currently doing to tackle housing. This presentation by Rob Adams (head of urban planning for the City of Melbourne) at the TEDx conference in Sydney in 2010 is probably the most influential thing I’ve ever seen/heard/read when it comes to urban planning. It is why I think that higher density is good and urban sprawl is bad. Rob Adams outlines Melbourne’s plan to double its population without increasing the footprint the city, while only using 7.5% of the land. NSW Off the Rails – Another Background Briefing documentary, this one is on the problems that Sydney has had with rail infrastructure. Unfortunately, this documentary is getting a bit dated, having been produced in 2008 and talking a lot about Labor’s later dumped metro proposal, but many of the problems and challenges still exist today. Off the Rails – A Four Corners follow-up to the Background Briefing documentary from 2008. This was produced a year later in 2009 and overlaps quite a bit with the Background Briefing documentary. Up until 1980, the Western Line had 4 tracks as far out as Blacktown. This allowed trains to be separated into express and all stations services, each with its own line, without having to worry about express trains getting stuck behind slower all stations trains and unable to overtake them. From Blacktown, one track pair went Northwest towards Richmond and another track pair continued West to Penrith and the Blue Mountains. The lack of a second track pair between Blacktown and Penrith made express services difficult, potentially adding 9 minutes to a train trip for Penrith commuters. This problem was solved in 1980, when the track between Blacktown and St Marys was quadruplicated, allowing the separation of trains depending on their stopping patterns. There was one proposal to extend the quadruplication all the way to Penrith in 2002 when the Fast Rail Link was proposed. 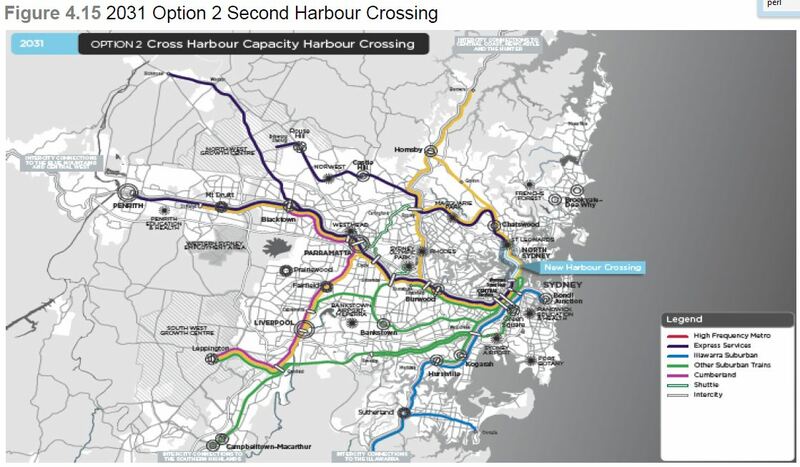 This would be a private sector project that would also construct a tunnel from Parramatta to the CBD, allowing a trip from Penrith to the CBD to be cut from 55 to 28 minutes. However, it would do so by gaining exclusive control of a track pair between Penrith and Westmead, before continuing though the underground tunnel. This would prevent the operation of express trains between Penrith and Parramatta on the remaining Cityrail track pair, forcing Penrith commuters that did not pay for the premium express service onto 84 minute all stop services. This, along with concerns that the $2.5 billion price tag was highly optimistic, ultimately led to the government rejecting the proposal. A more recent proposal is the Western Express, first announced in February 2010 as part of the Metropolitan Transport Plan (which I wrote about here), it would involve the construction of the $4.5 billion City Relief Line, a new line between Redfern and Wynyard. This would then connect up to the “express” Western Line track pair (officially known as the Main West Line, with all stops trains using the Suburban West Line), allowing express trains to remain separated from all stops trains all the way to the Northern end of the CBD. Currently, interurban trains from the Blue Mountains and the Central Coast use the Main West Line, but terminate at Central Station as they still use V-Set trains, which are longer than suburban trains and do not fit into the shorter underground stations in the CBD. A City Relief Line would be expected to have longer platforms, and also potentially screen doors that are commonly found in Asian metro systems. The Western Express was deferred by the incoming O’Farrell Liberal Government earlier this year, but based on recently released draft plans this appears to have been a genuine deferral, rather than code for cancellation. Next week: Gymea to Caringbah duplication. Best of the Rest: Is medium speed rail fast enough? A feasibility study into high speed rail (HSR) by the federal government released earlier this year got a few people talking about the possibility of HSR in Australia. However, the high cost ($70 billion to $110 billion just to build the infrastructure) seems very excessive to me, especially considering all the benefits you could get from investing that money into the suburban rail networks. What did catch my eye was a piece on medium speed rail on Transport Textbook, which suggested connecting Sydney and/or Melbourne to some of their satellite cities (Newcastle, Wollongong, Bendigo and Ballarat). Rather than aiming for the 250km/hr to 350km/hr required for HSR over long distances, increasing speeds to something around half of that over a much shorter distance and still obtain a significant benefit, but at a much lower cost. For example, increasing the average speed to 112km/hr would allow a Newcastle-Sydney trip to take just 90 minutes (compared to the current 170 minutes). A very interesting take on the question of is fast enough good enough? Randwick council rejected a plan to increasing housing next to the University of New South Wales and Prince of Wales Hospital on November 8 by a 10-5 vote. The plan, which is contingent on improved transport infrastructure (i.e. light rail), would have seen an additional 1,500 dwellings built mostly along High Street over the next 20 years by increasing height limits from the existing 3-4 storeys to 4-8 storeys. Councillors appear to have been pressured by 7,500 signatures opposing over-development. The Southern Courier quotes Keiran Bowie, who organised the petition, as saying that it is “vital to get the infrastructure right before considering further development”. However, the plan was contingent on getting transport infrastructure right anyway, which led Green Councilor and light rail advocate Murray Matson to warn that the move could put the future of light rail to Randwick in jeopardy. I think Murray Matson is exaggerating the claim a little bit. As I’ve pointed out before, there are plenty of reasons why the Randwick light rail line will get built. But he is right to be supportive of the development proposals, and it should go ahead. The Randwick health and education precinct has 13,000 jobs and 46,000 students, many of whom travel into Randwick each day. By providing additional housing right next to this area (literally across the street), you could gets thousands of workers and students out of motorised transport and on their feet, reducing congestion, not increasing it. Compared to most other parts of Sydney, this is an area with excellent existing transport infrastructure, plentiful in jobs and with a massive variety of pubs, cafes, restaurants and cafes. If you’re going to increase density anywhere, then this is exactly where you want to do it. Unfortunately, it seems the NIMBYs might have won this round. Free train travel before 7AM? Reports yesterday in the Sydney Morning Herald and Channel Seven (see below) suggest that the NSW government is seriously considering free train travel in Sydney before 7AM in an attempt to reduce morning congestion. The cost of doing this is the lost revenue, not just of the commuters who switch from after 7AM to before 7AM, but also for all the commuters who currently travel before 7AM. A trial is expected to be held some time next year to see how effective such a move would be. The rationale behind this move appears to be to get some sort of congestion charging on public transport. Currently, there are discounts for return tickets purchased after 9AM, so free travel before 7AM would effectively make travel between 7AM and 9AM more expensive relative to the shoulder periods which currently enjoy much more free capacity to take on additional passengers. Melbourne introduced such a scheme in 2008 in which any train trip completed by 7AM would be free. By 2009 just under one quarter (23%) of commuters travelling on trains before 7AM had made the switch to the free service, having previously travelled after 7AM. The move wasn’t universally supported, with Melbourne’s Public Transport Users Association (PTUA) pointing out that three quarters of commuters travelling before 7AM were already willing to pay. Why then, they argued, would you forgo revenue that could be used to improve the train network elsewhere when it would not provide a significant benefit? The PTUA also raised the problem of not including free travel on buses or trams during this period. Under Melbourne’s integrated ticketing system, you buy tickets for 2 hour periods which entitle you to unlimited travel within a certain zone. If you need to catch a connecting bus or tram, then once you pay for you bus/tram ticket the train costs you no extra (unless you are crossing from one zone to another). The change in Melbourne was accompanied by a strong push to encourage employers to allow their employees to adopt more flexible work hours. This would definitely help, as would the government taking a lead in offering such options to the public service. I could also see those in the construction industry or shift workers, both of which tend to start work early, making the move from driving to taking the train as a result of this move. This would mean on-road congestion as people make the shift from cars to trains and more revenue from the tickets for the return trip on off-peak trains with spare capacity. Ultimately, the decision on whether this is worth the costs depends on what you consider the alternatives to be. If the alternative is to effectively do nothing, and allow the train system to hit capacity, then this is a very expensive way to get more people on the trains. If however, the alternative is a costly expansion of rail infrastructure (new tracks, more trains, etc) in order to obtain additional capacity, then this plan to give free travel before 7AM could achieve the same outcomes for a lower cost, and would certainly be a better stop-gap measure than the recently touted metro proposal being tossed around recently. I remain cautiously optimistic on free travel before 7AM and look forward to seeing the results of any trial.